This last week has passed so quickly. I never stop writing or sewing but my photography is lagging behind. Too many gray days lately and as an amateur photographer, I need light to take good pictures. But I will take some today and perhaps have my husband take a few as well and get caught up. 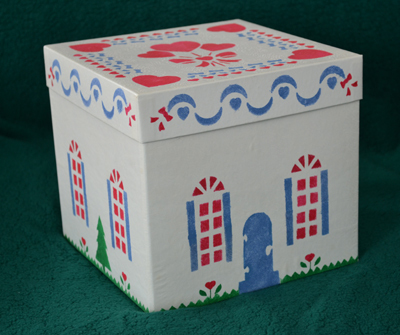 I wanted to share with you our post office boxes that we stenciled years ago. The brown one was done before the two white ones for each of my daughter’s. The idea is not original, but came from a Tasha Tudor book, A Time to Keep. They are easily made using store bought stencils and/or ones that you make yourself using plastic mylar and an Exacto knife. Simply use a stencil brush, loaded with inexpensive craft paint. “Pound” your brush to clear off the excess paint on a piece of scrap paper as you want only a dry dusting of paint on your brush to paint on your stencil. You might want to try a few on paper first to get the hang of it. Of course our post office boxes are strictly amateur. No professional job here at all, but no matter as we had a good time making them and have since enjoyed using them each year. (Our white boxes were inexpensive cardboard gift boxes that we bought, and the brown one was simply a recycled plain brown box that came with a gift in it. 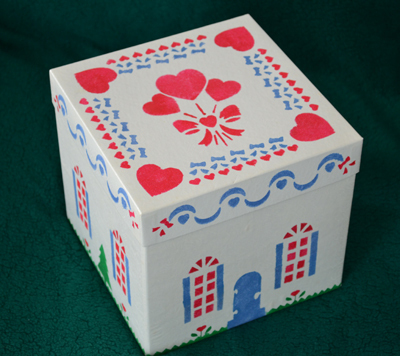 When I was in elementary school, I always loved decorating shoe boxes each year to hold our Valentines. 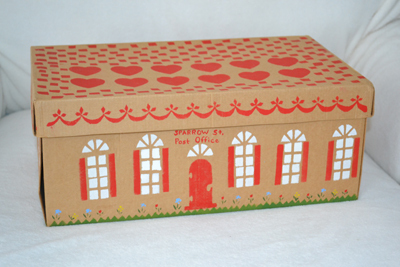 Construction paper and plenty of pasty glue was all it took to transform these boxes. 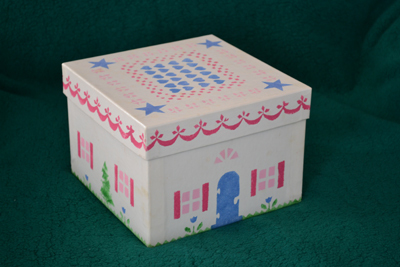 So whether you paint your post office boxes or decorate them using construction paper, tin foil or even doilies, it is a fun activity for all, and make wonderful post office boxes to use for years to come! 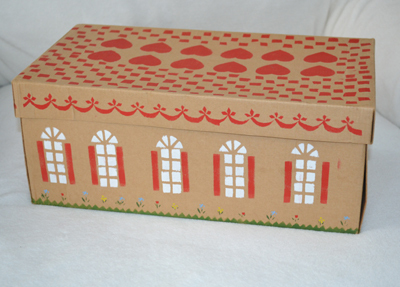 We place our Valentines in these boxes each year, other along with other small treats that we either make or purchase. 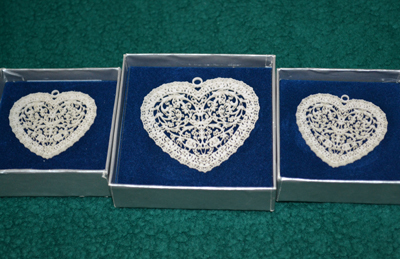 We also have special hearts that my husband bought for the girls and me when he stopped at the Amana Colonies when he moved out ahead of us on his way to the Vermont. They are delicate Opelle glass giftware made by Corning and are truly little heirloom treasures . We carefully store them in our post office boxes and enjoy them year after year. This is the season for hearts and love. Don’t miss taking this opportunity to tell someone just how special they are! 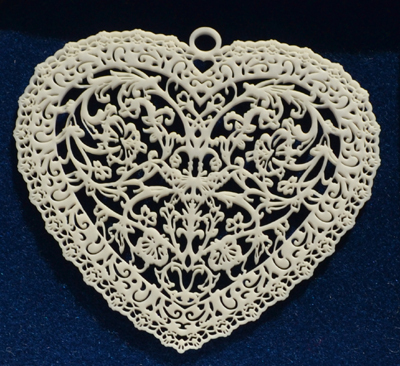 You are very special to us and so we are have a special Valentine Sale through the end of the month. Check out our Etsy store, if you haven’t already! And if you purchase something be sure to use the code “LOVE15” to get 15% off the purchase price. If you have any difficulty with this just let us know and we will be sure that you get your discount. Happy Valentine’s Day from Little House!